This article was originally published in Business Insider. You can read the article here. As medical students training at the institution Dr. Corwin leads, we agree: we do need it – and we need it urgently. Unlike Dr. Corwin, we, along with a growing number of hospital leaders, believe “Medicare for All” is the only solution for universal coverage and cost reduction. Medicare for All is a universal, comprehensive single-payer system in which healthcare is financed by one public agency but privately delivered. It would cover all medically necessary services and eliminate co-pays, premiums, and deductibles, leading to improved financial security when individuals or families get sick. It would also give patients the freedom to choose their doctor. HR 676, a bill introduced in the US House of Representatives with 123 Democratic co-sponsors last year, and the NY Health Act, a state bill that has passed the New York State Assembly in each of the past four years, would both establish such a system. In his interview, Dr. Corwin first asks “what’s the tax structure the US would need to support [Medicare for All]?” Both HR 676 and the NY Health Act have well-defined funding mechanisms. Each proposes a progressively graduated payroll tax paid by employers and employees, as well as a progressive tax on non-employment income such as capital gains. HR 676 also includes an increase in personal income taxes on the top 5% of earners and a small tax on stock and bond transactions. While many recent headlines claim that Medicare for All comes with a hefty price tag for taxpayers, it is vital to understand that this increase will be more than offset by the elimination of co-pays, premiums, and deductibles, resulting in net savings for 95% of U.S. households. 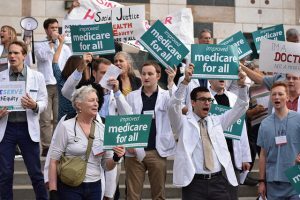 Studies on the fiscal feasibility of HR 676 and the NY Health Act predict that the proposed funding mechanisms will sustain a Medicare for All system while saving billions of dollars annually. The business community is also warming up to the idea of Medicare for All. Employer spending on healthcare continues to rise dramatically: the average employer contribution to premiums per worker has risen nearly 70% in the past decade. Despite repeated claims of government inefficiency, Medicare currently operates at roughly 2% overhead cost, compared to 12.4% overhead for private insurers. These lower administrative costs, along with reasonable limits on drug prices, procedures, and devices will result in billions of dollars of savings for businesses and consumers that can be redirected into the private sector. Dr. Corwin also asked “Does Medicare for All make sense for the US as a country?” We believe it does—as do 70% of Americans, including 84.5% of Democrats and 51.9% of Republicans. Medicare is a national treasure: before age 65, when most Americans are insured by private companies, the U.S. has the worst mortality rates of any comparable countries; shortly after 65, when Americans become eligible for Medicare, the U.S. shoots to the top of the rankings. Additionally, Medicare beneficiaries have much higher satisfaction rates than those insured by private companies. Medicare for All will expand these benefits to the entire country. Medicare for All is something all Americans can get behind, because it is for all Americans. It is bigger than any one hospital, insurer, or patient. As future physicians, our goals align with Dr. Corwin’s: we want universal healthcare coverage and we want to reduce costs. Medicare for All will do both. Is it time for Medicare for All in the U.S.? Dr. Corwin said “I think we should have that debate.” We wholeheartedly agree. ACTION ALERT: Support immigrant justice by saying NO to the public charge!